Your business life is hectic. Meeting deadlines and handling all the necessary details are urgent priorities for you. We understand. ACT! was created for people like you who must manage a growing business and associated business relationships. You need more than a paper-based method, spreadsheet, or e-mail system where you spend too much time looking for scattered information. Choose ACT! and provide superior service to your prospects, customers, or anyone you contact regularly because you have a complete, integrated view of your relationships— all in one easy-to-access location. Impress contacts with your follow-up, leave no task undone, and make informed decisions so you can successfully advance your business. ACT! is for individuals and small business customers in a variety of industries looking to organize contact information, manage daily responsibilities, and communicate more effectively to improve your productivity. How can ACT! help you? 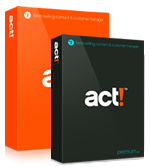 Work more effectively with ACT!, the #1 selling contact and customer manager. organized access to the information you need. Be up and running quickly because ACT! is easy to learn and use. Manage your daily responsibilities so important calls, meetings, and to-dos don’t slip through the cracks - and ultimately improve your productivity! Gain instant insight into the performance of your business using dashboards and reports for more informed decision making. Easily customize ACT! to fit your unique business requirements and ensure you are capturing the exact data you require. Remotely access relationship details, along with your schedule, for the information you need, when and where you need it. Integrate ACT! with applications you use every day, including Microsoft® Office and popular accounting solutions, to work the way in which you are accustomed. Meet your sales quotas and drive revenue with ACT!. Keep all your important relationship details for quick, organized access to the information you need for that sales call or meeting. Find the exact relationship details you need instantly using powerful search capabilities in an easy-to-use format. Manage your daily responsibilities by scheduling and tracking activities within ACT! so important sales calls, meetings, and to-dos are not overlooked. Monitor your leads from first interaction through close, ensuring no sales opportunity is lost. Communicate consistently and successfully with your prospects and customers to remain top of mind. Gain instant insight into your pipeline and performance using dashboards and reports for more informed decision making. Enable your sales team to meet sales quotas and drive revenue with ACT!. Keep all the important relationship details in one central location for quick, organized access to the information your team needs for sales calls and meetings. Make sure your team manages their daily responsibilities by scheduling and tracking activities within ACT! so important sales calls, meetings, and to-dos are not overlooked. Monitor leads from first interaction through close, ensuring no sales opportunity is lost. Gain instant insight into your team’s pipeline and performance using dashboards and reports for more informed decision making and to improve sales results. Enable your team to remotely access relationship details, along with their schedule, for the information they need, when and where they need it. Provide an easy-to-learn, easy-to-use contact and customer management solution for your organization with ACT!. Easy to administer with automatic backup, database maintenance, and synchronization. Implement as-is or customize to fit your needs. Easy to learn and use, so users will be up and running quickly, with no training required. Offers secure, central access to contact information. Do you have a growing team? Consider ACT! Premium Solutions which are specifically designed to benefit larger teams. With ACT! Premium Solutions, you and your team benefit from increased data sharing capability, group scheduling functionality, advanced opportunity tracking and customization capabilities. Robust dashboards and reports, security on multiple levels, and more. And with online, offline, and mobile options, you have anywhere access whether office-based, traveling, or remotely. Your business life is hectic. Meeting deadlines and handling all the necessary details are urgent priorities. We understand. ACT! Premium Solutions were created for teams of people like you—people who must manage their growing business and associated business relationships. You and your team need a way of tracking and sharing information with team members and managers to ensure goals are being met. Choose ACT! Premium Solutions so you can provide a better customer experience because you have a complete, integrated view of those relationships—all in one easy-to-access location. Maximize productivity so you have time to focus your attention on business-critical activities. Your managers get a detailed snapshot of team performance to ensure targets are being met, while comprehensive reporting helps them make informed decisions to successfully advance the business. Experience the positive impact ACT! Premium Solutions will have on your business. **We recommend choosing ACT! Premium for workgroups of 10 users or more. Centralize important prospect and customer relationship details for quick, organized access. Manage interactions at the company or account level for a complete view of relationships with that organization. Get up-to-speed quickly and remain productive because of the easy to learn and use interface, eliminating the need for formal training. Find specific relationship details instantly using powerful search capabilities in an easy-to-use format. Manage daily responsibilities by scheduling and tracking activities to ensure individual and team productivity. Forecast and track sales opportunities to stay on top of all new leads and to provide management with insight into sales pipelines. Gain instant and accurate insight into individual and team performance using dashboards and reports. Communicate consistently and successfully with prospects and customers using Microsoft® Outlook® or other e-mail solutions used by your organization. Share and secure precious prospect and customer relationship details across teams of users. Easily customize1 ACT! Premium Solutions, with little technical knowledge required, to fulfill the requirements of your organization and to ensure adoption. Deploy and implement ACT! Premium Solutions quickly and maintain with ease. Support an anywhere workforce with Windows, Web2, and mobile access options. Integrate ACT! Premium Solutions with the applications already used by your organization to make the most of existing technology investments. Enhance the power of ACT! Premium Solutions with extensibility options available to administrators. Meeting ever-increasing sales quotas while selling against competitors is a key challenge for many sales reps. ACT! Premium Solutions are here to help you. Meet your sales quotas and drive revenue by guiding your deals through close using a sales process customized to fit your selling philosophy. Manage your daily responsibilities and automate redundant tasks so you feel confident nothing is forgotten, while you focus on more important things, like selling. Get a complete view of your relationships and provide superior service to your customers while also expanding current accounts, with easy access to all the details about their unique circumstances. Reach out to your prospects more effectively with professional and timely prospecting communications. Focus your attention where it counts by assessing your sales pipeline, including your top sales opportunities and total sales for the month, all in one view using interactive dashboards and eliminate the need to run and analyze reports. Motivating sales reps to use a solution to manage their prospect and customer information can be challenging for many sales managers. The good news is, sales people love using ACT! Premium Solutions. Ensure rapid end-user adoption, with little or no training required by you, because ACT! Premium Solutions are easy to learn and use. View how your sales reps are tracking to their sales goals and how their time is allocated using interactive dashboards and reports. With this information, you can coach your sales reps, and help underperforming reps get back on track without delay. Enhance sales predictability and results by providing a customized sales process for your team to guide their deals through close. Streamline your team’s daily functions so they can focus more on selling rather than administrative tasks, to ultimately improve their productivity. Finding the right solution for your users to manage their prospect and customer information, that also matches organizational requirements, is a big task for many IT administrators. Reduce implementation burdens by installing ACT! Premium Solutions, which enable quick deployment and integrate with existing technology investments. Match your organization’s unique needs by customizing1 ACT! Premium Solutions using layout designers that require little technical knowledge and help ensure user adoption. Accommodate the access needs of your users with Windows®- and Web-based2 deployment options which have seamless interfaces. Ensure database security so information is only accessible by those whom you have granted access, while you rest assured this data is protected. Maintain ACT! Premium Solutions easily by utilizing automatic database functions1 so your organization and your users always have up-to-date prospect and customer information, with little work required by you. Populate 60+ pre-defined fields including Name, Company, Phone, Address, Web site, E-mail, Last Meeting Date, ID Status, or add your own. Find anyone or any Contact detail instantaly with Look-ups and Keyword Searches. Store complete Contact information, including E-mail, Notes, History, and more. Add virtually unlimited Secondary Contacts related to primary Contacts such as administrative assistants. Consolidate and eliminate duplicate Contac, Group, and Company Records for the cleanest data. Add documents or document shortcuts to Contact Records to keep track of proposals, quotes, and more. Enter Virtually unlimited date and time stamped Notes and History to track every relationship detail. Manage daily responsibilities so important calls, meetings, and to-dos don't slip through the cracks. Link Contacts to Companies so when core Company information changes, the changes push to each Contact for easier updating. Company records contain a roll-up of all Notes, history, and Opportunities associated with Contacts at that Company. Create new Company and Division records to get a more complete picture of the entire relationship. If a Contact is linked to a Company record, the company name will display as a hyperlink on that Contact Record for quick access to Company details. Create new Groups and Subgroups quickly and easily. Save any Look-up as a Group definition to create Groups instantly. Easily see relationships using the Group Tree View for quick, easy navigation. Further organize Groups into Subgroups, accommodating up to 15 hierarchies and up to 14 levels of Subgroups. View shared Contacts, Notes, History, Activities, Opportunities, and Documents in Group roll-up tabs. Create and maintain Static or Dynamic Groups, Static Groups allow Contacts to be added manually. Dynamic Groups allow Contacts to be added automatically based on group definition. Facilitate your daily communication with contacts using letter templates such as Intial Communication to Presentation Follow-up, and more. Quickly identify you last communication with a contact by viewing the Last Reach, Last Attempt, Last Meeting, and Letter e-mail fields. Select a contact or grouop of contacts and perform a mail merge to a letter or e-mail. Link all correspondence to associated contacts for a complete record of everything sent and received. Write Letters using Microsoft Word or the built-in Word Processor which supports tables, graphics, HTML, and spell checking. Utilize Excel for importing information or for exporting contact and opportuniy lists to share with non-ACT! users or for further analysis. Sync you ACT! and Outlook calendars. Integrate with Outlook for easier e-mail communications to your contacts. Utilize the built-in Sales Process or customize it to suit your specific business needs. View all sales opportunities at once or filter by Users, Estimated Close Date, Status, Sales Stage, Amount or Probability of Close. View graphical Sales Pipeline and graphs for insight into sales trends. Create a product list for use by the entire team. Capture cost, item number, and price for consistency, and easilly import your product list to avoid data entry. Add memo, picture, add yes/no fields so you can capture information that is required by your business. Create your own activity, history, priority, or other field types so ACT! is customized to your business. Use the Layout Designer to change background colors or to add logos to your layout. Utilize the report designer to create custom reports and output most reports to Excel, HTML, PDF or E-mail. Customize existing ACT! reports, including 40 standard reports and 20 preformatted Sales reports. One click export to Excel allows you to export Contact, Group, Company, or Opportunity Lists to an Excel spreadsheet for sharing with non-ACT! users or for further analysis using built-in, customizable pivot tables. A. ACT! is the #1 selling contact and customer manager that helps you organize contact information, manage daily responsibilities, and communicate more effectively to improve your productivity. With over 2.7 million users and 41,000 corporate customers, ACT! has maintained its position as #1 for 20 years because it’s renowned for being easy to learn and use, and is an effective solution for anyone who regularly works with contacts. Q. What is a contact and customer manager? A. A contact and customer manager allows you to manage all tasks and information related to developing and maintaining relationships with the people, groups, and companies with whom you do business. Contact and customer management software provides you with a 360-degree view of your contact information so you don’t have to jump from one application to another to complete a task, plan your day, or execute your sales strategies. Q. Who typically uses ACT!? Business owners and managers who need to track customers, prospects, vendors, and business associates. Sales professionals and consultants who need to manage clients and prospects. Real estate agents who need to maintain relationships with buyers, sellers, referrers, property owners, and other agents. Bankers, financial planners, and brokers who need to maintain contacts with clients, build financial strategies, and communicate with financial product providers. Public relations and advertising professionals who need to manage clients, media, prospects, writers, designers, and vendors. Recruiters who need to track job candidates and clients to match job seekers and employers efficiently. Seminar and training professionals who need to manage interactions with instructors, promoters, attendees, facility managers, and equipment suppliers. Manufacturers’ representatives who need to track transactions and interactions with manufacturers and customers. Q. What are the differences between ACT! and ACT! Premium solutions? A. ACT! is designed for individuals, sales professionals and sales teams of up to 10 users who share data1. ACT! Premium solutions (ACT! Premium and ACT! Premium for Web) are for sales teams, small businesses, and corporate workgroups who require greater scalability2and data sharing, more flexible deployment options, advanced workgroup functionality, and additional administration and security features. Q. What are the differences between the EX Edition and ST Edition? A. Both editions offer the same great feature set to accommodate your workgroup or team. The key difference lies with the database engine and scalability. The EX Edition ships with Microsoft® SQL Server™ 2005 Express Edition, and the ST Edition ships with both SQL Server 2005 Express Edition and SQL Server 2005 Standard Edition. With a different database engine comes a different recommendation for scalability or networked user counts. Q. Do you have a hosted solution? A. Sage Software does not currently provide a hosted solution, however, many partners and ACT! Certified Consultants (third party) maintain ACT! Premium for Web licenses on their equipment for their customers. In this “IT Maintenance” model ACT! licenses remain the property of the customer and are non-transferable to others. Those licenses are maintained by the third party on behalf of the customer. Q. Do you have a version that works with Apple® Macintosh®? A. Yes. Apple Macintosh computers that feature a dual boot Microsoft® Windows® OS feature can run ACT! on the Window OS and are supported as long as the PC meets listed minimum system requirements. See system requirements. Q. What is the ACT! solutions’ support policy? A. Your purchase of ACT! solutions include Getting Started Support. Getting Started Support includes phone support for up to 30 days from the date of product registration. Getting Started Support is limited to product installation. Your system must meet the minimum system requirements to be eligible for support. Call 770.475.9213 to get started. For support after that, you may purchase a support contract or purchase service on a Pay-Per-Call basis. Q. What is Product Activation and how does it work? A. ACT! Product Activation is a technology designed to protect you from purchasing pirated software. ACT! Product Activation is a quick and easy process and is part of the general process of product registration. You will be prompted to register when you first launch the product. Follow the wizard to submit your registration information and serial number via Internet or phone activation methods. If you do not register and activate, the product will run in trial mode until you do, for up to 30 days. After that time, the product will not run unless you register and activate. Q. What is the return policy for ACT! solutions? A. You may return ACT! solutions for any reason if you are unsatisfied within 30 days of the date the product was purchased for a full refund. Note: ACT! (Standard version) can only be used with up to 10 users sharing one database. If customer adds an 11th user or greater, ALL users must upgrade to the ACT! Premium EX or ST. Published minimum system requirements are based on single user environments. Actual scalability and number of networked users supported will vary based on hardware and size and usage of your database. Sage Software scalability recommendations are based on in-house performance tests using the recommended server system requirements found at. ACT! Requirements to ensure your system meets these requirements. You must have one license of ACT! per user. Software4advisors, software4advisors.com,Contact and Customer Relationship management software, CRM for financial, Financial CRM, ACT! CRM Software, Practice Management Solution, FSC Practice Management Solutions, Practice Management Software, CRM for Financial, ACT! for Financial Advisors, client and contact management software, crm software, asset allocation software, portfolio management software, financial planning software, registered reps... The reviews on ACT! Software are 90% good to excellent. According to the reiews on ACT! - it is highly recommended to purchase.